However family pressure could not be resisted and he entered legal practice (possible in those days without a degree). Enrolling in the one year postgraduate law programme at Harvard, family circumstances kept him from completing the exams but not from continuing as a practitioner. However not everyone was a critic. In the audience was Dean Wigmore, Dean of Northwestern University, who soon persuaded Pound to accept a professorial post at Northwestern and later commented that Pound’s speech ‘struck the spark that kindled the white flame of high endeavour now spreading through the entire legal profession and radiating the spirit of resolute progress in the administration of justice.’Discovering that Pound had not graduated in law, he gave him an honorary degree. Pound’s writing remained relevant and thought-provoking and he certainly influenced legal thinking. Those he influenced included Chief Justice Warren Burger, (another judge who managed to upset conservatives) defying his sponsor, the anti-progressive Richard Nixon, by upholding the Miranda decision and supporting the majority in Roe v Wade. In 1976, 70 years after Pound’s keynote address, the ABA conference returned to St Paul, Minnesota. It was here, at the appropriately named Pound Conference, that the profession finally provided Pound with what amounted to the apology and acknowledgement he so richly deserved. Joining the ABA as sponsors were the Conference of Chief Justices and the Judicial Conference of the United States. Burger clearly had considerable influence over the programme as he is credited with issuing the invitation to Professor Frank E.A. Sander, a notable Harvard academic, to participate. Dealing broadly with various issues of dissatisfaction with the legal system, Dispute Resolution was one stream among a number and many papers were delivered. However it is Sander’s paper’ ‘Varieties of Dispute Processing’ that has provided the conference’s most memorable legacy and continued the work begun by Pound in his 1906 address. This article was first published on the Australian Dispute Resolution Research Network, you can find the original here. For more information on Roscoe Pound, see: Northwestern University’s Professor Stephen Presser ‘Foreword’ in Roscoe Pound, The Ideal Element in Law (Online Library of Liberty, 1958); N.T.H Hull, Roscoe Pound and Karl Llewellyn, Searching for an American jurisprudence (The University of Chicago Press, Chicago, 1997) 65; and ‘Perspectives on Justice in the Future’ Proceedings of the National Conference on the Causes of Popular Dissatisfaction with the Administration of Justice, West Publishing Co., St. Paul Minnesota 1979. 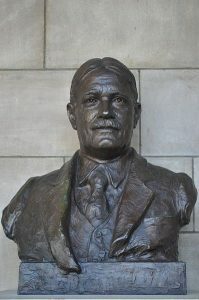 Photo credit: Roscoe Pound bust by Avard Fairbanks, Nebraska Hall of Fame – Creative Commons. Dr. Rosemary Howell has experience as a lawyer, strategic planner, teacher and CEO and has served a term as Secretary General of the Law Council of Australia. Her company, Strategic Action Pty Ltd, delivers mediation, coaching, facilitation, strategic planning and training services to a diverse range of business and government clients nationally and internationally. She is a member of The Dispute Group and sits on the Board of Resolution Institute. She is a Professorial Fellow at UNSW in Sydney and a Senior Fellow at Melbourne University, her doctoral work investigated ‘How Lawyers Negotiate’ from the perspective of clients and other stakeholders. Rosemary is a member of the Rules Committee for the ICC International Commercial Mediation Competition and also sits on the International Advisory Board of the CDRC Vienna Mediation Competition and is a member of its Mediation Working Group. Rosemary, this was a wonderful post. It would have been great to begin the GPC with this, but probably even more fitting that it comes at the close of all the conferences.